The rising star's online fundraising haul managed to beat Senator Bernie Sanders' record of $5.9m last month in the first 24 hours of his campaign. According to his campaign, he received donations from every state and territory, totalling $6,136,763. The campaign has not released how many donors contributed or the average contribution amount. The Texas Democrat still has no campaign manager, but US media report he is in talks with someone to take on the job. 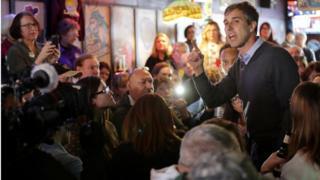 On Monday, Mr Sanders' campaign used Mr O'Rourke's fundraising burst to urge his own supporters to donate to "close the gap", Politico reported. If Beto O'Rourke's campaign success continues, he may keep Donald Trump from being re-elected. But who else has a shot at becoming the next president?